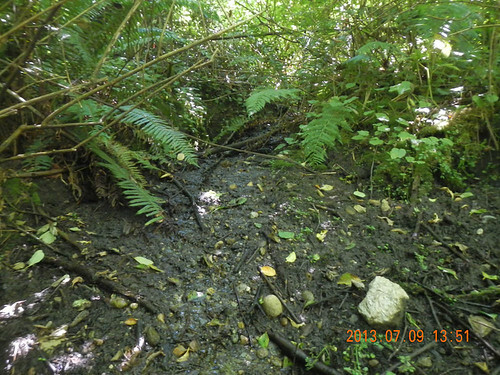 This summer I have a number of questions to answer about the seeps in North Beach Park. I used a Garmin eTrex 10 for recording trail and waypoints. But, um, didn’t know how to save, so I lost all that data. The walk was still worthwhile, though, because I worked out a consistent method for data recording and what to observe. This had been almost completely enclosed by a holly and laurel thicket until some of us went at it with a weed wrench. This picture was taken yesterday; compare to this picture taken in April. 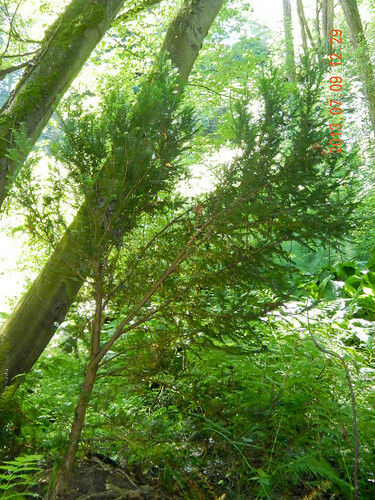 The angles are pretty different, but it looks to me like the yew is really spreading out towards the light. That was the good news; the bad news is that I’m also seeing more signs of herbivory. The Headwaters Bowl is large, flat, and open, surrounded by slopes. There is very little canopy cover, and what there is comes from trees leaning over the bowl from the slopes. This makes the Headwaters Bowl a scrub/shrub wetland. and took several more picture of it. One of the questions about the seeps is their flow rate. How I’ll do that is yet to be determined. I think a more important issue might be how deep is the soil layer. For instance, because the stream has a sandy bed, the footing there is quite firm, as opposed to places with a deep, saturated soil layer. 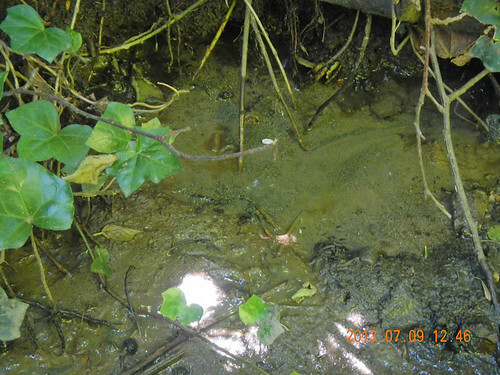 Another seep I discovered is very large, about 200-300 square feet. I remember it from other seasons. The footing there is quite firm, which means I think that the soil on the top is being carried into the stream. If that’s the case, I’ll try slowing down the movement with either barriers or plants. If it turns out the seep is running over the glayed soil (anoxic sand), we might have to put down barriers to catch the dirt for a while. I’m reluctant to put down barriers because I think the water will find the one way through, and then channelize and move faster, when the intent is to slow down the water. Straw wattles might do the trick, allowing the water through while trapping the dirt. I’d also like to avoid staking something into the slope, as I think sometimes that just cuts away the part of the slope below the stake. I’m going to have to start over, not least because of the GPS data not being saved. But that’s part of the fun, I think.